Run the attached test.php script in the console. 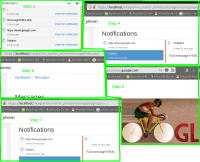 This will create four new notifications for the admin user. Click on the notification marked "Subject"
Click on the notification marked "https://www.google.com"
Click on the notification marked "/message/index.php"
Click on the notification marked ";"
Run the attached test_34.php script in the console. +            // Link to mark read page before loading the actual link. But apparently, the notification.contexturl can be NULL. We should not include redirecturl as the link parameter in that case. MDL-62776 Store internal / local contexturl for notifications as relative URL only.